Most galaxies host supermassive black holes at their nuclei, each with millions or billions of solar-masses of material. There is thought to be a torus of dust and gas around the black holes, and an accreting disk that becomes very hot as material falls onto it, in turn heating the torus and circumnuclear gas and dust. Such an active galactic nucleus (AGN) radiates across the spectrum while the dust often blocks the innermost regions from view. Powerful bipolar jets of charged particles are often ejected as well. Radiation from the torus can be seen directly at infrared wavelengths and, when it scatters off the fast moving particles, at X-ray energies. The relationship supports the general picture of galaxy growth by gas accretion, except that for some reason smaller galaxies – those with fewer than about ten billion stars – seem to make slighter fewer stars than expected for their masses (the Milky Way is right at the turnover, with about ten billion stars and a rate of roughly one new star per year). What does it mean that the Milky Way is right at the turnover? Does it mean that if the Milky Way had made just slightly fewer stars than it does, then the Milky Way, too, would have made fewer stars than expected for its mass? I find it interesting, by the way, that low-mass galaxies make fewer stars than expected for their masses. That would explain why small galaxies in the nearby universe still undergo bright starbursts. These galaxies have a lot of gas "to spare", and if they can get a starburst going, they have a lot of fuel available. That didn't make sense to me either Ann. The MW now has many times more than ten billion stars, and I'll expect that it even had many times more than that 6 BYA too. Galaxies with extremely high rates of star formation (from hundreds to thousands of solar-masses worth of stars per year) are rare. Our Milky Way, for example, makes only about one star a year. The process of star formation heats up dust to emit in the infrared, and extreme starburst galaxies that make this many per year shine so brightly they can be spotted at cosmological distances. When gravitational lensing by a fortuitously intervening galaxy or cluster of galaxies magnifies the signal, even farther away and cosmically earlier galaxies can be detected. To date only a handful of these extreme starburst galaxies have been confirmed from the universe’s first billion years of existence. Although still a small sample, they offer important insights into how stars were made at primordial times when most chemical elements were less abundant. They also help astronomers understand star formation in cases where the physical processes are so dramatic when compared to the process in our galaxy. TRAPPIST-1 is a system of seven Earth-sized worlds orbiting an ultra-cool dwarf star about 120 light-years away. The star, and hence its system of planets, is thought to be between five-to-ten billion years old, up to twice as old as our own solar system. For scientists seeking evidence for life elsewhere, the advanced age provides more time for chemistry and evolution to operate than the Earth had. On the other hand, the planets are all close to the star (in fact they are probably tidally locked to the star with one side always facing it), and consequently would have soaked up billions more year's-worth of high energy radiation from the star’s winds, adversely affecting any atmospheres they host. In a new paper in The Astrophysical Journal, CfA astronomers Federico Fraschetti, Jeremy Drake, Julian Alvardo-Gomez, Sofia Moschou, and Cecilia Garraffo and a colleague carry out theoretical simulations of the effects of high-energy protons from a stellar wind on nearby exoplanets. These particles are produced by stellar flares or by shock waves driven by magnetic events in the stellar corona. Measurements of solar eruptive events provide the scientists with a basis for their simulations. The astronomers calculate the first realistic simulation of the propagation of energetic particles through the turbulent magnetic field environment of an M dwarf star and its wind, and they tailored the details to the TRAPPIST-1 system. They find that particles are trapped within the star's magnetic field and are directed into two polar streams focused onto the planets’ orbital plane - independent of many of the details. The scientists conclude that the innermost putative habitable planet in the system, TRAPPIST-1e, is bombarded by a proton flux up to a million times larger than that experienced by the present-day Earth. Nevertheless, there are many variables at play, for example the angle between the magnetic field and the rotation axis of the star, and consequently a large uncertainty remains in how these effects actually are manifest in individual situations. The Transiting Exoplanet Survey Satellite (TESS) was launched on April 18 of last year with the primary objective of discovering transiting planets smaller than Neptune around stars bright enough for spectroscopic investigations of their masses and atmospheres. Before TESS there were roughly 385 exoplanets known with masses smaller than Neptune, with orbital periods ranging from less than half-a-day to about two Earth-years. CfA astronomers Dave Latham, Samuel Quinn, Dave Charbonneau, Jonathan Irwin, Kristo Ment, Jennifer Winters, Martin Paegert, Dimitar Sasselov, and Willie Torres and a large team of TESS collaborators report that TESS has found a "hot Earth" exoplanet, rocky in composition, only about fifty light-years away and orbiting its dwarf star in a mere eleven hours. The planet has a radius of about 1.3 Earth-radii, enough to host an atmosphere, but its short orbital period means it lies very close to its star – only about seven stellar radii. The inferred surface temperature is about 800 kelvin, rather hot to be able to retain an atmosphere but possible. The scientists note, however, that if the planet had formed in roughly this close-in location, its atmosphere would likely have been stripped away in the star’s youth when it was more luminous and had more intense chromospheric activity. In any case, the planet's proximity to us offers the opportunity of characterizing any atmosphere it might have using transit and occultation spectra of the source and the result, interesting in its own right, would also shed light on the planet's formation. The supermassive black hole (SMBH) at the center of our Milky Way galaxy, Sagittarius A*, is by far the closest such object to us, only about 25 thousand light-years away. Although not nearly as active or luminous as other SMBHs, its relative proximity provides astronomers with a unique opportunity to probe what happens close to the "edge" of a black hole. Monitored in the radio since its discovery and more recently in the infrared and the X-ray, Sgr A* appears to be accreting material at a very low rate, only a few hundredths of an Earth-mass per year. Its X-ray emission is persistent, probably resulting from the rapid motions of electrons in the hot accretion flow associated with the black hole. Once a day there are also flares of emission that are highly variable; they appear more often in the infrared than in X-rays. Some submillimeter wavelength flares have also been tentatively linked to IR flares, although their timing seems to be delayed with respect to infrared events. Despite these intensive observational efforts, the physical mechanisms producing flaring around this SMBH are still unknown and are the topic of intense theoretical modeling. CfA astronomers Steve Willner, Joe Hora, Giovanni Fazio, and Howard Smith joined their colleagues in undertaking a systematic campaign of simultaneous multiwavelength observations of flaring in SagA* using the Spitzer and Chandra observatories (the Submillimeter Array was also used in some of the series). In over one hundred hours of data taken over four years (the longest such dataset ever obtained), the team observed four flare events in both X-ray and infrared in which the X-ray event appears to lead the infrared by ten to twenty minutes. The correlation between the observed peaks implies there is some physical connection between them, and the slight timing difference is in agreement with models that describe the flares as coming from magnetically driven particle acceleration and shocks. Exactly simultaneous events can’t be completely ruled out, however, but the results are nevertheless inconsistent with some of the more exotic models that involve the relativistic motion of electrons. If future simultaneous observations planned for the summer of 2019 also see flaring, they can provide new constraints on the time lag and on associated physical models. Most stars form in clusters of hundreds of stars. In contrast to isolated stars, whose formation is increasingly well understood by astronomers, the hows and whys of cluster formation are much less well understood. Issues include the structure of the cluster in its early stages and the physical processes that determine how it fragments into many stars. To address these questions, astronomers focus on observations of clusters of young protostellar objects, those early in their evolutionary lives. The molecular gas associated with these regions is used to reveal the densities and kinematics of the regions. CfA astronomers Phil Myers, Mike Dunham, and Riwaj Pokhrel joined with colleagues to analyze twenty-four clusters, all closer than about three thousand light-years. The median diameter of these clusters is only about one light-year, and in an area of this radius they host on average about four protostars and one newly formed main-sequence star (for comparison, the nearest star to the Sun, Proxima Centauri, is 4.2 light-years away). Comparisons between the clusters reveal that continuous low-mass star formation often occurs over periods of several millions of years, much longer than the time it typically takes for a single star to become active. This result implies that many generations of stars are present in the cluster. The scientists also found that for the more compact clusters, characterized by sizes of about one light-year, the stars are separated by distances that agree well with simple theoretical expectations about fragmentation. For more diffuse groups, however, the protostellar separations are always larger than expected with the implication that other processes are at work. Brown dwarfs are stars less massive than the sun and unable to burn hydrogen. They comprise (at least in mass) a bridge between planets and stars, and astronomers think that they form and evolve in ways different from either planets or stars. Gravitational microlensing is an excellent method for detecting them because it does not depend on their light, which is dim, but rather their mass. When the path of light from a star passes by a brown dwarf acting as a lens, it is magnified into a distorted image, like an object seen through the stem of a wineglass, allowing the detection and characterization of the lensing object. Thirty-two brown dwarfs have been detected by microlensing so far. Five are in isolation, but most are in binary systems, companions to faint M-dwarf stars. They provide important constraints on brown dwarf formation scenarios. The critical parameter of a brown dwarf is its mass, but it is difficult to measure the mass of a lens using microlensing. Using this method, one measures the magnified and distorted stellar image as it changed in time (it varies as the Earth's vantage point moves), but the technique offers no handle on the distance, and the larger the distance, the larger is the mass needed to generate the same-sized distortion. Recognizing this problem, scientists had predicted that if it ever became possible to observe a microlensing flash from two well-separated vantage points, a parallax measurement (the apparent angular difference between the positions of the star as seen from the two separated sites) would determine the distance of the dark object. The Spitzer Space Telescope circles the Sun in an Earth-trailing orbit, and is currently 1.66 astronomical units away from Earth (one AU is the average distance of the Earth from the Sun). Spitzer is unique in this capability, and it has in fact been used successfully to measure the parallax distance for hundreds of microlensing events, thereby helping to determine the masses of the lenses. Heterocyclic molecules are those containing atoms of at least two different elements (plus hydrogen) arranged in a ring structure. Nitrogen heterocycles are key components in biological nucleic acids, and in theories of the origins of biogenic molecules they were synthesized from abundant, simpler nitrogen molecules like hydrogen cyanide, HCN. Adenine, one of the four constituent bases of nucleic acids, is thought to have formed from one of the two known two-ring nitrogen heterocycles, glycolonitrile (HOCH2CN). In the cold interstellar medium of space, glycolonitrile could assemble on the surfaces of icy grain surfaces via reactions between formaldehyde (H2CO) and hydrogen cyanide. 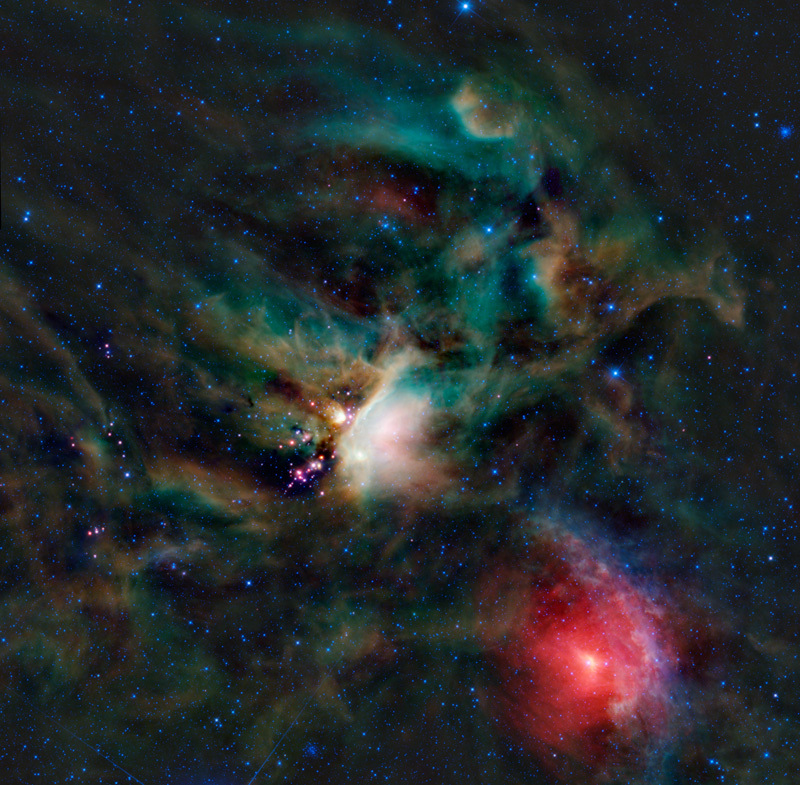 Astronomers have calculated that glycolonitrile could then be broken apart by ultraviolet light, leaving a variety of simpler nitrogen-bearing molecules, some of which have been detected in molecular clouds in space. Glycolonitrile itself, however, has not been reported leaving a step in the theory of the formation of nucleic acids unconfirmed. CfA astronomer Rafael Martin-Domenech and his colleagues used the ALMA telescope facility to search for glycolonitrile in the young, solar-type protostar IRAS16293-2422B. This well-studied object lies about five hundred light-years in the constellation of Ophiuchus. It has a cold outer envelope of gas and dust and a hotter inner region heated by the star extending out to about a hundred astronomical units. Numerous, simpler organic molecules had already been seen in this warm zone. The team searched for the characteristic spectral signature of glycolonitrile in three frequency bands of ALMA, and found thirty-five of its transitions that were unambiguous. They modeled the data to reveal two components at two temperatures, about 24K and 158K, coming correspondingly from material in both the cold outer envelope of the star and its hotter inner zone. Their chemical analysis predicts a smaller abundance of the species than is actually seen, for both the cold and warm components, including under a variety of likely conditions including the cosmic ray ionization rate. The team concludes that some other chemical pathways must be operative, but that this critical chemical has now been measured and the theory is in general on the right track. Both central black hole growth and star formation are fed by the abundance of molecular gas and dust that can be traced by the infrared emitted by the dust. Dust grains, heated by the radiation from young stars and AGN accretion, emit strongly in the infrared. Since AGN activity also produces X-rays, the expectation is that AGN should track strong dust emission and that X-ray and infrared emission should be correlated. CfA astronomer Mojegan Azadi was a member of a team that examined 703 galaxies with active SMBH nuclei using both X-ray data from Chandra and infrared from Spitzer and Herschel, the largest sample to date making this comparison. Although the team did find a trend consistent with the infrared correlating with AGN X-ray activity over a wide range of cases, they did not find one when compared with the AGN's infrared (not- X-ray) contributions. Since the AGN infrared comes largely from a dusty emitting torus around the SMBH, the difference could point to the role of the angle with which we view the torus. These results help to refine the current models of AGN activity, but the authors note that more sensitive, deeper observations should be able to sort out more clearly the physical processes associated with the AGN. When the supermassive black holes at the center of galaxies accrete material, they can eject powerful jets of charged particles at speeds approaching that of light. These particles in turn emit radiation across the electromagnetic spectrum, from radio to gamma-rays. When the jets happen to be aligned toward the Earth, these objects are called blazars, and in a flare they can emit as much radiation as a million billion suns. NASA's Fermi Gamma Ray Astronomy satellite, launched in 2008, has detected many bright gamma-ray sources, but determining what they are and if any are blazars is difficult because Fermi’s resolution on the sky is only about the size of a quarter full moon, and that large area of sky typically contains many sources that could be emitting in the gamma-rays. Moreover, blazars are notoriously variable at high energies and their irregular flickering can make them difficult to pinpoint exactly. Extensive observations of possible candidates with optical or other facilities can be successful but are very time consuming. A team of astronomers including CfA astronomers Raffaele D’Abrusco and Howard Smith found that the infrared colors of blazars are generally unique because the emission, rather than from hot dust as is typical, is instead coming from processes associated with the blazar jets. 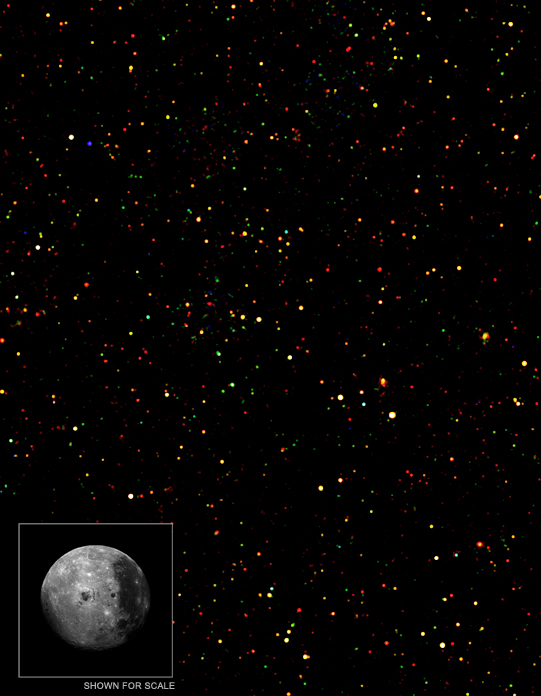 They used color data from the Wide-field Infrared Survey Explorer (WISE) in conjunction with catalogs of radio source to identify the most promising gamma-ray candidate objects in the Fermi survey and for the past several years have followed them up, with a success rate confirming blazars of about 90%. The same team of astronomers has now extended their original 2014 work using all the most recent data collected by Fermi and a new algorithm for analyzing the WISE data, and have produced two new catalogs of WISE blazar candidates with a total of 15,120 candidate sources. The new work will enable many more detailed followup analyses of gamma-ray blazars, as well as other kinds of blazars. The gamma-ray sky is known to reflect, in its dramatic appearance, many other kinds of extreme physical processes, for example possible dark matter annihilation activity in some scenarios, and the new catalogs will enable a much more complete investigation of the dominant contributor to the gamma-ray universe: blazars. The closest exoplanet to us, if we include only single stars like the Sun, is the planet around Barnard's Star, Barnard's Star-b ("BSb"). (The planet Promixa Centauri-b is closer, but Proxima Cen is part of a triple-star system with Alpha and Beta Centauri, and understanding the evolutionary development of the planet is more complicated.) BSb orbits at a distance similar to that of Mercury around the Sun, but Barnard's Star is a cool M-dwarf star and so despite the planet being close to the star it probably resides near the snow line – the distance where stellar irradiation is weak enough to allow volatile elements to condense onto the planet’s surface. This makes BSb an especially interesting planet and possibly a keystone for future progress understanding planet formation and atmospheric evolution. Extreme stellar activity and winds, especially in M dwarf stars, play an important role in the development of a planet and its atmosphere. These kinds of activity are linked to a star's magnetic activity, but unfortunately models are still unable to predict how atmospheric initial conditions evolve under intense radiation environments. Nevertheless, progress has been made using simple models. In the case of Proxima Centauri b, scientists have found that it is probably subject to wind pressures ten thousand times larger than occur at the Earth. Might stellar wind effects also be disrupting any atmosphere on Barnard’s Star b? CfA astronomers Julian Alvarado-Gomez, Cecilia Garraffo, Jeremy Drake, and Sofia Moschou and their colleagues conclude otherwise. The scientists note that BSb is much farther away from its star than is Promixa Cen b, well outside of the domain of the star's corona. Moreover, an analysis of Barnard Star’s rotation and other properties implies that it is much older, between about seven and ten billion years, and any magnetic field processes should be considerably smaller. The astronomers conclude that although today the planet Barnard’s Star b may have a relatively mild space climate (comparable, nevertheless, to bad space weather conditions for Earth), in its early years it probably did undergo significant disruption. Today, however, BSb might retain an atmosphere that could studied.